SCROLL DOWN TO SEE ALL SALE PRODUCTS AVAILABLE! 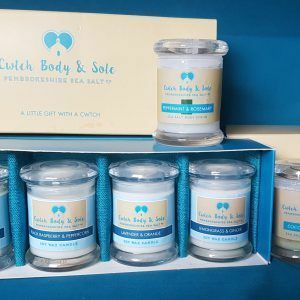 Our soy wax scented candles and sea salt body scrubs are now available in a selection of fragrances in gift boxes. 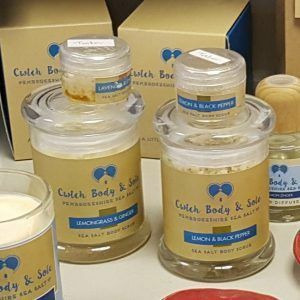 A Little Gift from the Sea for scrubs and A Little Gift with a Cwtch for candles, choose from one of our ranges or send us a message to chose your own favourites. 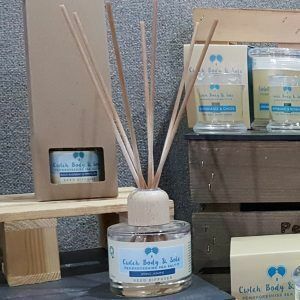 Cwtch Body & Sole offers a range of high quality, handcrafted cosmetics and room fragrances that are entirely natural. By using only the best ingredients we can ensure that our products deliver high performance with environmental responsibility. You won’t find micro-beads or any other damaging additives in any of our products, just natural ingredients that are kind to us and our environment. 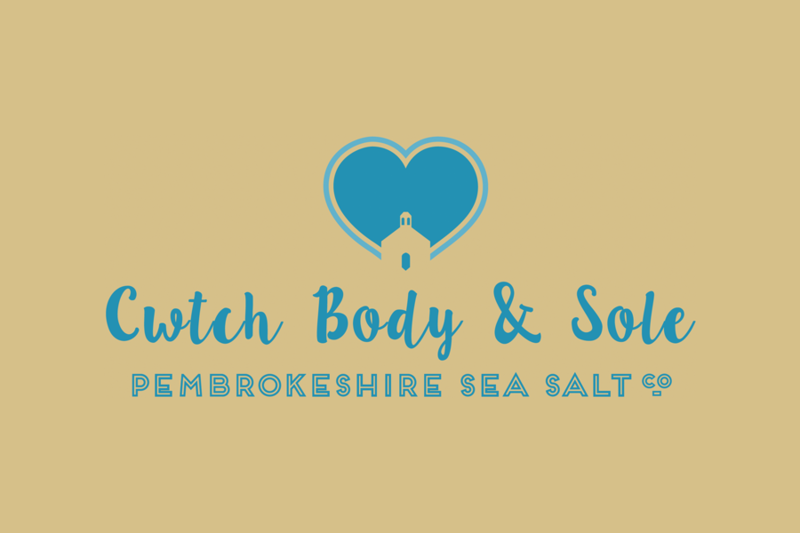 Our beautiful body scrubs are made using pure white Pembrokeshire Sea Salt crystals, blended carefully with luscious coconut oil, essential oils and perhaps a little-dried citrus zest or grated nutmeg, for added colour. The natural salts act as a gentle exfoliator, while the coconut oil moisturises beautifully to leave your skin feeling super soft, and smelling delicious. These scrubs can be used on your face and on your body, and just a teaspoonful, used a pinch at a time, will keep your skin silky smooth for up to five days. These products have proven popular among people with sensitive skin conditions, who often find that the combination of rough with smooth works wonders. The natural anti-ageing, anti-bacterial and anti-fungal properties of the coconut oil in our scrub, may provide additional health benefits, beyond looking and feeling great! Our luxurious scented candles and reed diffusers are made with the highest quality plant-based waxes and oils, combined with premium fragrances, many of which include natural essential oils. All of our base ingredients are hand produced in the UK or Europe, to the exacting safety standards of the International Fragrance Association (IFRA). 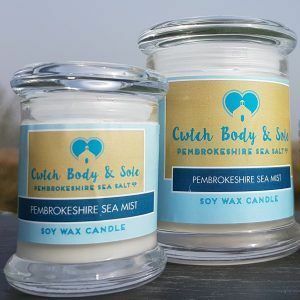 The wax for our candles and the base oil for our reed diffusers are extracted from plants such as the soya bean, resources that are completely renewable and sustainable. Our candles burn cleanly, evenly and slowly and will fragrance your home beautifully for up to 30 hours. They have a sumptuous creamy, texture and colour, and are presented in attractive clear glass jars; gift box options are also available. The fine base oil in our diffusers feeds slowly and evenly through porous reeds, to fragrance your room for up to 10 weeks, without the reeds clogging or needing to be turned. Presented in clear glass jars with wooden lids, this room fragrance looks great and smells amazing! Presented in a gift box, it makes the perfect present. Our scrubs are available in a range of aromas, designed to delight your senses, complement our room fragrances and provide you with the perfect pamper experience, at home. Coconut & Lime – this zesty, zingy scent will make you feel alive. Cleansing and purifying, this fragrance will leave you with a lasting freshness and brighten up your day. Lavender & Orange – this combination of floral with citrus creates an uplifting yet calming blend that will help you relax and de-stress. A favourite among men and women, the additional antibacterial properties of lavender make this scrub especially good for you! Lemon & Black Pepper – another citrus based scrub, designed with men in mind but loved by women too. Energizing and uplifting the heat of the black pepper can also help improve circulation and soothe aching muscles. Lemongrass & Ginger – an exotic blend combining the freshness of lemongrass with the spicy warmth of ginger, this has to be our best seller. As well as having a gorgeous scent this scrub can also help relieve stress and muscle pain. Nutmeg & Ginger – spicy yet sweet, rich and woody; this scrub is a real winter warmer and summer pleaser. Great for fatigue muscle aches and circulation, it can also help with arthritis and rheumatism. Peppermint & Rosemary – fresh, cooling, stimulating and invigorating, this blend is great if your get up and go needs a little help along its way. This pleasing aroma can help improve alertness and circulation, relieve headaches or nausea and works well on the sinuses. The candles and reed diffusers are offered in an array of pleasing fragrances, including floral, musk, citrus, other fruits, and exotic blends. Black Orchid – with a patchouli, sandalwood and musk base, refreshing tones of blackcurrant and bergamot combined with spicy, warming essences of clove and ginger, produce this sensual, uplifting scent; perfect for the bedroom or a cosy corner in any home. Daffodil – a reminder of spring, of woodland walks and new awakenings. A fresh, evocative scent that will instil ‘Hiraeth’ among the Welsh. Perfect for living rooms, kitchens and conservatories. Lavender & Orange (candle only) – this combination of sweet herbaceous lavender and fresh, zesty orange produces an uplifting aroma that is also soothing and relaxing. Great to chill out with or to accompany a warming bath! Meadow Lily – a subtle mix of woodland and floral draped in dreamy musk and creamy vanilla, this fragrance is rich and warm but at the same time sweet. Memories of warm summer days walking through lush green meadows; perfect for all living spaces – try it in a kitchen or conservatory. Spring Jasmine – a complex blend of woody, fruity and musk aromas with sweet bergamot, neroli and jasmine, this exotic perfume evokes memories of holidays overseas or warm summer evenings. Black Raspberry & Peppercorn – the fruity raspberry freshness added to the crisp warmth of pink and black peppercorns make this fragrance a favourite all year round. Perfect for a summer evening or a cold winter day. This new addition to our range has been popular from the outset. Clementine Spice – this perfect concoction of zesty orange, and warm, spicy cinnamon, nutmeg and clove is pure ‘Christmas in a jar’. Perfect for the living room while enjoying some mulled wine in front of the log fire! A favourite, that is actually popular throughout the year. Cranberry Drift – another festive favourite that remains popular throughout spring and summer, this scent holds notes of green leaf, apple, forest fruits and musk that combine to make a crisp, fresh, fruity delight that will tickle your senses! This bold aroma is perfect for the porch, hallway or stairs. Lemon Zinger – sweet and refreshing, rich and uplifting, this strongly scented candle is highly effective in eliminating strong or lasting odours. Perfect for your kitchen or other eating areas. Lime Cooler – clean, fresh and powerful, this sassy little perfume is energizing and cheerful, perfect for summer days. Oh Christmas Tree! – reminiscent of walking in an evergreen forest, this blend of fir, cedar and musk refreshed with citrus is calming and comforting yet energizing and uplifting. A perfect antidote to the stresses of a modern Christmas! 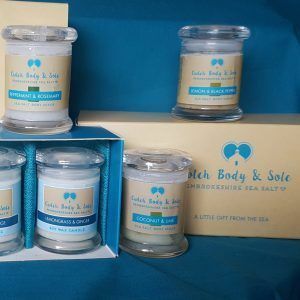 Peppermint & Eucalyptus – one to awaken the senses! This strong combination of peppermint with fresh eucalyptus creates a fresh, earthy aroma that may improve stamina and alertness, and reduce signs of headache. A good one for use against strong odours. Sandalwood & Black Pepper – bold and complex, rich and sweet, warm and stimulating, yet calming; a sophisticated blend that is popular with men and women. Coffee – an indulgent, comforting aroma combining the strong rich scents of coffee, with the sweetness of caramel and cream. Perfect for the kitchen or dining room to enjoy over a morning coffee or set the ambience for a good meal! Lemongrass & Ginger – a firm favourite with our customers this blend of tangy lemongrass with warm, spicy ginger is stimulating, sensual and refreshing. Perfect any place, any time, anywhere. Midges hate it, making it the ideal choice for summer evening sat outside. Vanilla – opulent and luxurious, think rich creamy pannacotta! This fusion of buttery Madagascan vanilla, nutmeg and soft velvety musk creates a distinctive aroma that is warm and sensual. Ideal for living rooms, dining rooms, bedrooms or general areas of the home. Well, Cwtch is the best word in the Welsh language, or so they say. A Cwtch can mean a cuddle or a hug, a small space where things are stored or the place that the dog loves to sleep! Anyone can have a Cwtch, young and old, male or female, but a proper Cwtch is no ordinary cuddle; it’s an all enveloping hug that lets you know you are loved, makes you feel safe, and tells you that everything will be ok.
We chose the name Cwtch Body and Sole because it sums up how we want you to feel when using our products.